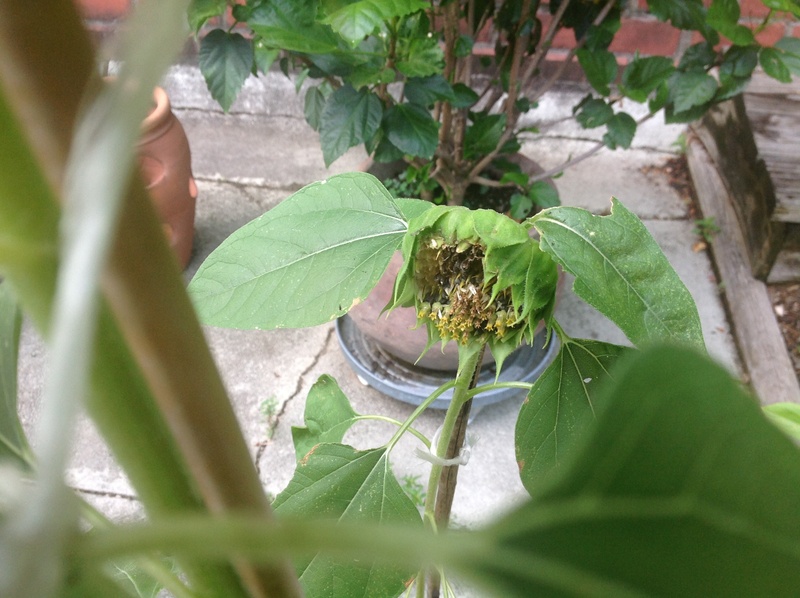 Transitions and the Massacre of the Sunflowers By the Goldfinches! As I wandered around my yard this past week I noticed certain telltale signs of the change of seasons. The flowers are producing fewer blooms; those that are still blooming are growing spindly and their colors are fading; weeds are popping up everywhere as I have grown lazier in the hot, humid weather; some plants are simply dying; fall perennials are already starting their new cycle. A day later I saw an amazing sight. A pair of goldfinches, male and female, were hanging upside down on my daughter’s sunflower plants, decimating the flowers and devouring all the seeds. At first I was captivated by their beauty; then I was stunned by their greed and determination. They went at the few blooms with a vengeance, leaving no seed uneaten. I wondered what my daughter would think when she came home and saw the devastation. These thoughts led to others. Transitions are hard for everyone, even when they are good transitions. What kinds of anticipations or dread are kids having about beginning the new school year? Do we as teachers think about kids’hopes and fears as we begin our new school year so full of ideas and projects for them to do? What was their summer like? Did they go to camp, summer school, stay home or go back to their parents’ native countries to stay with relatives? Summers can be catastrophic for some kids who don’t have proper childcare while their parents are working; who have nowhere to go because there’s no available transportation; who spend much of the summer indoors playing video games because there is nothing else to do. For the children who experience these hardships, the return to school can be the best thing that happens to them. Others more fortunate may have a hard time giving up lazy habits they’ve gotten into, or simply may not feel very motivated about returning to all the work and testing that they know they will face during the school year. Yes, the massacre of the sunflowers by the goldfinches is a brutal reminder that we are about to enter a new phase of the year, and that transitions can sometimes be tough to go through. Let’s try to remember that, for the sake of our students, on the first day of school…and every day thereafter. Hello friend! Such a beautiful, thoughtful post and a powerful reminder. I’m struck how teachers see the world around them differently- sunflowers made you think of transitions to school! Laundry made me think of ownership in the classroom. We are just a different sort! (Lol….in a good way). Your words about kids who might have had a very sad summer playing video games rings true. I was setting up my classroom yesterday at school and there is an end of summer reading club going on. A teacher asked me to stand with a few of the students so she could use the restroom for a minute. I asked the boys about their summer- did they go anywhere? To the pool or beach? They mostly stared at me, smiling, but silent. One boy said he swam in his neighbor’s pool. They did not have many stories to tell about what they did this summer. I will be more mindful of this now. So excited for you, Barbara, as you have this first fall in wonderful health, able to enjoy and plan new adventures. Can’t wait to hear what you do! As teachers we are working with fragile human beings (which everyone who criticizes us fails to remember), and we must try to mindful of what is going on in the hearts of our students…find ways to check in…to listen. The best advice I ever got about teaching was from a very seasoned administrator who said to me early in my career: “Just listen. The children will tell you what they need.” We all get caught up in our plans, but are we taking time to listen? Thanks so much for your warm wishes regarding this, my first real fall retirement month. Whatever I do, I am sure you will be a part of it since you are such a powerful and loving mentor. This was such a lovely post. I had an interesting conversation with a neighbor yesterday. While I was celebrating the fact that the early morning cool meant that my favorite season, Fall, was almost here, she was bemoaning the fact that the early morning cool meant that her favorite season, Summer, was almost over. This is a tough transition for her and it was a good reminder for me to hear her take on it. Really…we are all in flux much of the time. The modern world provides us with so little constancy we need to savor whatever pleasures we can find between the transitions. I have a friend, too, who loves summer and hates winter. I am preparing myself for the next 6 months of complaints! Thanks for your response. I love this post about transitions. It was actually a little hard for me to read about the sunflower being massacred as I have been taking photos of sunflowers and as the summer is its ripest, sunflowers are so present. Yet, you are right…transitions happen. Birds prepare for winter. Children go back to school. Some enter into retirement. Some transition in and out of illness. All of which you spoke so eloquently. I am already back in school. Students have been here since last Monday and teachers the Monday before. I am not ready yet to let go of summer. In this transition, I will find snippets to hold on to…the last remnants. Thank you! I wrote about retirement, too, today, Barbara, in a different light, but all the same, about transitions. You’re so thoughtful in your consideration of some students’ summers and their need to be in school, doing something. I remember a student sharing with me a long time ago that he got to go to K-Mart during the vacation. It has stuck with me because that is when I learned how different some live during their summers. Unfortunately, as a former ESL teacher I found out that examples such as the one you mention are the “norm.” And yet we expect these students to somehow produce the same results on class projects and exams as those who are privileged to lead much richer, more fulfilling lives. It didn’t take me long to realize that my classroom (and others) was the only place enrichment was going to take place, and so I did my best to make it as user-friendly and interesting as I could. I look forward to reading your post today. Previous Previous post: What’s in Your Classroom Survival Kit?